South County has a lot to offer. For example, Chula Vista is the second largest city in San Diego County. National City is the commercial hub of industry and the second oldest city in the county. And San Ysidro is home to the largest factory outlet shopping center on the West Coast of the United States. Chula Vista is blessed with a beautiful harbor, picturesque rolling foothills, pristine lakes, charming new communities and a stylish new shopping center east of the 805 Freeway. This forward looking city is definitely worth discovering. It is only seven freeway miles south of downtown San Diego and the San Diego Trolley provides easy, frequent access via the Blue Line. 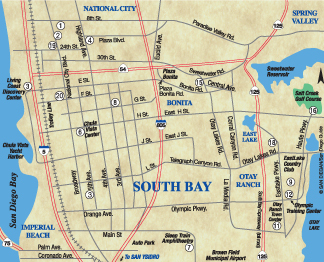 Plus, Chula Vista has easy access to two major north/south freeways: Interstate 5 and Freeway 805, which are connected in an easterly direction by Highway 54. And now east of the 805 is the new Highway 125 toll road. A must-see for San Diego families and out-of-towners is the 316-acre attraction called The Living Coast Discovery Center (3) , at 1000 Gunpowder Point Drive in Chula Vista and formerly known as the Chula Vista Nature Center (619-409-5900). It’s a unique kid-friendly zoo and aquarium all in one. And it’s located, freeway close off the I-5 freeway at E Street in Chula Vista, on the southern edge of San Diego Bay in Chula Vista. Chula Vista is also proud to be the home of the official warm weather U.S. Olympic Training Center (12) at 2800 Olympic Pkwy. (619-656-1500). You can watch America’s top athletes train and compete in ten sports including archery, cycling, track and field, field hockey, tennis, rowing, canoeing/kayaking, the triathlon and soccer. Free guided tours are offered on Saturdays at 11 a.m. To support the Olympics, you can also purchase T-shirts and other Olympic souvenirs at their Olympic Spirit Store. Or you can enjoy the thrill of a lifetime by taking a leap of faith from an airplane at 10,500 ft. above sea level with Skydive San Diego. They are located at 13531 Otay Lakes Rd. (619-216-8416). Nationally known entertainers ­regulary perform at Sleep Train Amphi­theatre (7) at 2050 Entertainment Cir. in Chula Vista (619-671-3500). For the latest lineup of musical headliners visit their website at [livenation.com]. Chula Vista is also a popular destination for golfers. There are three challenging public golf courses in the area—The Salt Creek Golf Club (16) (619-656-2373), Chula Vista Municipal Golf Course (15) (619-479-4141) and East­Lake Country Club (9) (619-482-5757). The Otay Ranch Town Center (11) is a classy 860,000-sq. ft. shopping destination that draws people from as far south as Tijuana and as far east as La Mesa. It is home to the best of the best including Macy’s, Coach, REI, Barnes & Noble, Best Buy, The Gap, Hollister Co. and a host of fabulous restaurants. Though it has every store you’re looking for, the center is still small enough to find your way around without having to use a mall map. The Otay Ranch Town Center (619-656-9100) lies east of the 805 Freeway via Olympic Parkway. Chula Vista’s downtown shopping district (8) will make you feel like you stepped back in time. In fact, the cars are still parked diagonally on the main street. This district is centered around Third Avenue and F Street. A popular weekly shopping attraction is the open-air Farmer’s Market (8), which is held every Thursday 3 p.m.–7 p.m. at Center Street and Third Avenue (619-422-1982). The other major shopping district in downtown Chula Vista is the Chula Vista Center (6) (619-427-6701) at H Street and Broadway. This 923,000-sq. ft. complex is home to JC Penney, Victoria’s Secret and more. The most popular place to dine are BJ Pizzeria and The Olive Garden Restaurant. Chula Vista is the hub of delicious dining alternatives with that thought in mind, the oldest, largest and most popular restaurant in all of South Bay is the 60 year old La Bella Cafe & Games (8) at 373 Third Ave. (619-426-8820). Generations of repeat customers come here daily to enjoy great tasting pizza, fabulous Italian specialties and their 3,000-sq. ft game parlor jammed full of ever parlor game imaginable. Aqui es Texcoco (4), is located at 1043 Broadway in Chula Vista (619-427-4045) [aquiestexcoco.com]. This is worth the drive no matter where you live. Revered by the travel channel as “the best of the best in San Diego County,” serving their house specialty of roasted lamb wrapped in a Maguey cactus leaf, there’s nothing quite like it. See Restaurants. For the best Italian gourmet cuisine in all of the South Bay, if not San Diego itself, dine at Via Lago Trattoria (18) at 866 Eastlake Pkwy, (619-216-8660). They feature live music several evenings a week. It is one of the seven Busalacchi restaurants. It’s located in the Village Walk Shopping Center. Also in this same center is The Broken Yolk serving breakfast and lunch (619-216-1144) and Karina’s Seafood Mexican Restaurant. Chula Vista continues to grow, especially on the east side of Freeway 805, with new communities and stylish shopping and dining destinations. And homes are both new and affordable. ments.com]. For a low ($925) a month you’ll be living in a fully-­furnished, move-in ready one-bedroom apartments with wall to wall carpeting, comfortable furnishing including a comfortable sofa, a frost free refrigerator, a gas range, ceiling fan, heater and lots of cabinet space for all of your belongings and linen space. And all utilities including gas, water and electricity are included in the low ($925) rental fee. National City, which is north of Chula Vista and south of downtown San Diego is San Diego County’s industrial business hub. It boasts more than 3,000 businesses in a tiny land area of only 7.3 square miles. Major employers include its huge marine terminal that processed 270,000 cars last year. It is also home to the county’s largest new and used auto sales center, The National City Mile of Cars (19) with an inventory of more than 5,000 cars. In addition to it’s many businesses, National City is also rich in turn-of-the-century Victorian homes. In fact, there are more Victorian homes in National City than anywhere else in California. The most promenent historical structure is a block long row of apartments aptly called Brick Row on Heritage Square (2) at 909 A Ave. (see map). Also visit [nationalcityca.gov] for a list of 25 historic homes complete with fascinating photos and address so that you can identify these structures as you pass by. One of the most recommended dining destinations in National City is Villa Manila Restaurant (1) at 500 E. Eighth St. (619-477-8512). It’s located in the Old Schoolhouse Square, which is very near Brick Row historic buildings on A Avenue. There is a large concentration of Filipinos living in San Diego, and this restaurant comes highly recommended. While in National City be sure to dine here.